On Wednesday morning there were clashes between protesters and the military at the Ministry of Interior, which the interim government feared might be invaded and/or torched. In Egypt, Interior is in charge of security police (Amn al-Dawlah), the force that is accused of using undue force and killing dozens of protesters since last Friday. The protesters are thus furious with the ministry. There were also clashes in Alexandria between protesters and police in front of the municipality building, in which one demonstrator was killed. Air Marshall Hussein Tantawi, the de facto military dictator of Egypt, attempted on Tuesday to mollify the hundreds of thousands of Egyptians demonstrating in cities up and down the Nile Valley on Tuesday. In a major concession, he agreed to move elections for a new civilian president (i.e. for his own replacement) to no later than June 2012. The earlier plan had been to delay presidential elections until late in that year. Tantawi alleged that the Egyptian military has no desire to remain in power and would retire to its barracks as soon as the president was elected. He even said that the military would leave sooner if a referendum of the Egyptian people demanded it. He said that parliamentary elections would be held beginning November 28 despite the turmoil. He officially accepted the resignation of the interim cabinet led by Essam Sharaf, but asked it to stay on until a new government could be appointed. The referendum suggestion is particularly dishonest. Military governments often offer to hold referendums rather than real elections. There is no real way to tell if someone has lost a referendum. What would it take for Tantawi to step down? If 52% of Egyptians said he should, he could maintain that nearly half wanted him to stay. Despite the withdrawal of the Muslim Brotherhood from the protest movement, tens of thousands thronged to Tahrir Square on Tuesday, in massive defiance of the military and security forces that had tried to clear the square when protesters began demanding that the military give up power. 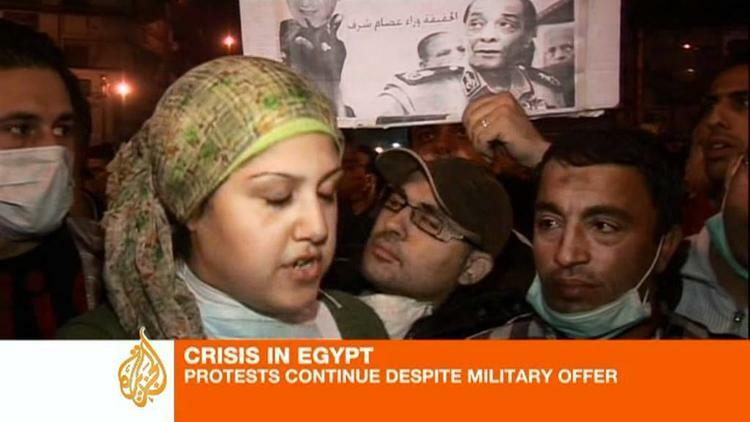 Two demonstrators were killed in Cairo on Tuesday. The military council met with a half dozen parties that are running in next week’s election, including the Muslim Brotherhood but also the Wafd. Amr Moussa, former head of the Arab League and now presidential candidate, was there. The center-right Wafd Party urged that the Nov. 28 elections be postponed two weeks, while the better-organized Muslim religious parties demanded that they be held on schedule. Presidential candidate Mohammed Elbaradei, former head of the International Atomic Energy Agency, declined to attend the meeting with the military council, but has been spoken of as a potential interim appointed prime minister. The Wafd newspaper reported Wednesday morning that Elbaradei had written to the military council offering to form a government of national unity, but only if the officers explicitly pledged to refrain from interfering with the interim civilian government’s decision-making and policies.